Financial planning can become a daunting task as you enter retirement. For many, retirement comes with added financial difficulties like living off a fixed income, managing debt and using services put in place specifically for seniors. This comprehensive guide offers helpful information and advice for navigating your finances as you age and will help you organize, plan and prepare for the future. Read on to learn more, or click the through the menu below to find out what you’re interested in. Organization is key to managing finances, particularly in retirement. After retirement, you will likely live off a relatively fixed income. This means you’ll need to have a stable budget in place and all financial decisions organized in order to maintain your current lifestyle. To help keep track of your important financial information, consider keeping a notebook or folder. Writing down important financial information can help you record your finances during retirement and help your family locate it in an emergency. 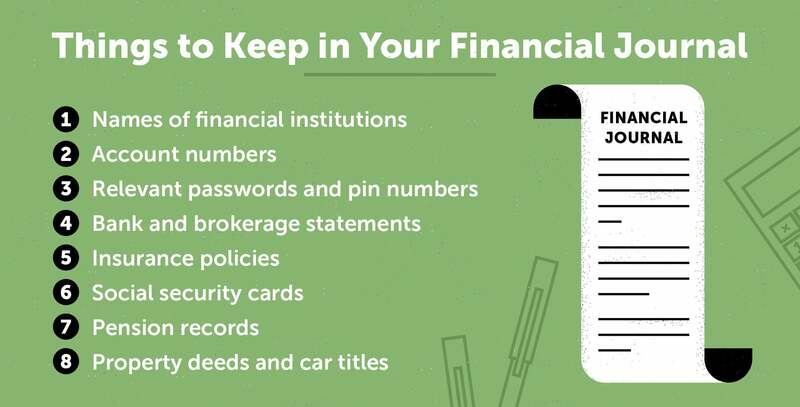 If you decide to create a notebook with your important financial information, consider letting a trusted relative or friend know where you plan to keep it. If you forget a piece of information or in case of emergency, having a trusted person be able to locate your notebook will be helpful. Close old accounts you no longer use or need. Look through your wallet or anywhere you keep financial records to see if you have extra credit cards or bank accounts you don’t need. Opt for electronic payments. This will drastically reduce the volume of mail you receive and help you keep better track of your billing expenses. Hire a financial advisor. Experts from reputable companies are likely more equipped to handle your finances and make good judgement decisions to increase your savings, maintain your retirement fund and ensure you’re well-funded for the rest of your life. Most seniors with normal cognitive aging maintain their capacity to manage money well into their 70s and 80s. Most seniors who have previous knowledge and experience with finances are able to adequately manage their money personally. Most seniors with cognitive impairment need help managing their money and making financial decisions to prevent fraud or abuse. Seniors experiencing cognitive impairment may be unaware of their mental decline and tend to feel confident about handling their finances. This confidence coupled with intact knowledge of finance and increasingly impaired judgement makes seniors more likely to be victims of fraud. To prepare for the possibility of cognitive decline, it’s important to take certain steps to protect yourself, your family and your finances. Always communicate with your family about your finances, consider using a professional financial consulting service and discuss the possible need for a Power of Attorney. There are many resources and services available for seniors in need of expert financial assistance. One of the most important decisions to be made in regards to financial management for seniors concerns a Power of Attorney (POA) document. This document allows an individual, usually elderly, to select another trusted person to act for them when managing their finances. A Power of Attorney is helpful in allowing a senior’s individually owned assets and finances to be maintained by someone with better ability to make financial decisions. POA documents can be written to become effective immediately, meaning they are not unreasonably difficult to obtain and can help get a senior help quickly. The principal party is the individual giving up power. They may also be referred to as the grantor or donor. In this context, the principal is the senior in need of financial assistance. The agent, or person receiving power, is the individual who will assume responsibility for the principal’s finances. Any adult can be appointed and in the context of aging, typically falls to the adult child or other relative of the senior giving power. Finally, the notary public is the licensed official who serves as a witness to the transfer of power. They are typically authorized by a state government and are a required party to the creation of a POA document. It is important to note that while legal counsel in the creation of a POA document is not necessary, it may be helpful in ensuring the best decisions are made surrounding the transfer of power. Creating a Power of Attorney document is a proactive way to manage your finances as you age. However, be careful to build the contract appropriately and willingly. Don’t allow others to pressure you. If you are not willing to grant access to your finances, you are not obligated to do so. 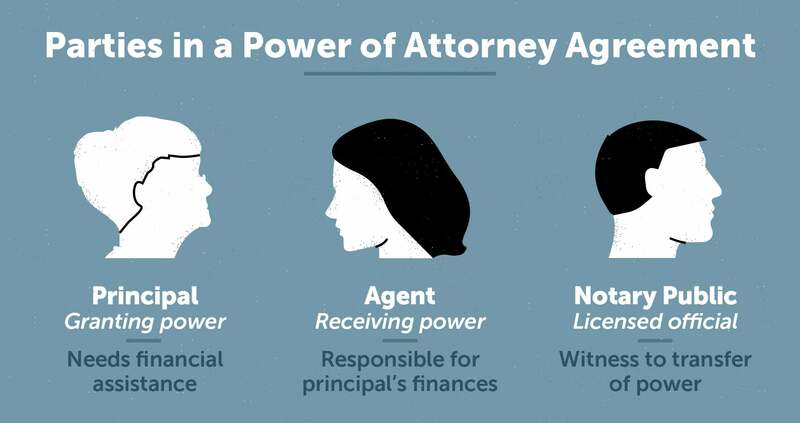 If you and a potential agent are deliberating on creating a Power of Attorney, take the time to choose wisely and consider all outcomes. Remember, your agent should always act in your best interest. Make your goals clear. Naturally, your financial agent should be someone you trust. However, they should also understand and be willing to follow your financial goals. Communicate your objectives with your agent and be sure they have at least basic knowledge of finance and investment. Be specific about the authorities you grant. Your Power of Attorney document should be highly detailed, but be sure to communicate to your agent the specific duties he or she is expected to fill. Specify which of your accounts they’ll be handling and to preserve the highest integrity, notarize each page of the POA document to prevent alterations. Make your POA durable. There are several types of Power of Attorney contracts. A POA that is durable will remain in effect even if you become incapacitated or unable to work together with your agent. A POA that is not durable would immediately be revoked in this situation. Another option is to create a springing POA, which is a type of durable contract that acts only in specific situations. However, a durable contract is the type that will best protect your finances after you are unable to manage them yourself. Know how to change or revoke your POA. If at any time you decide you no longer wish to have a Power of Attorney contract or would like your document modified, you have the right to do so. When altering or rescinding your agreement, inform your agent, your broker, advisor and any other relevant parties that may rely on it. Requirements for changing or revoking POA documents vary by state. Create a “plan B.” In the event that your POA agent is unwilling or unable to continue acting for you (or if you suspect fraudulent activity on the part of your agent), you should have a plan to replace them quickly. Name at least one successor or alternative to this role. A POA monitor may also be useful in ensuring your wishes are being acted upon appropriately. There are many services available to help you organize and plan your retirement life. However, there are steps you should take to be sure your finances fit into your future goals for retirement like travel, investment and helping family. In your retirement years, you rely on a lower income than you did in your earning years. To make your nest egg last, it can be helpful to create a detailed budget and stick to it. To begin preparing a retirement budget, you should collect recent bank statements, credit card statements, pay stubs and tax returns. These will be helpful in determining how your expenses will be covered. Next, list any expenses you plan for on a monthly basis as well as a small fund for emergency use. Calculating your monthly budget can be done by simply subtracting your total monthly expenses from your monthly income. If you’re unsure how to create a budget or would prefer to have a professional help you, there are many ways to make sure your budget accurately reflects your retirement lifestyle. There are also many resources available to use as templates for budget creation. 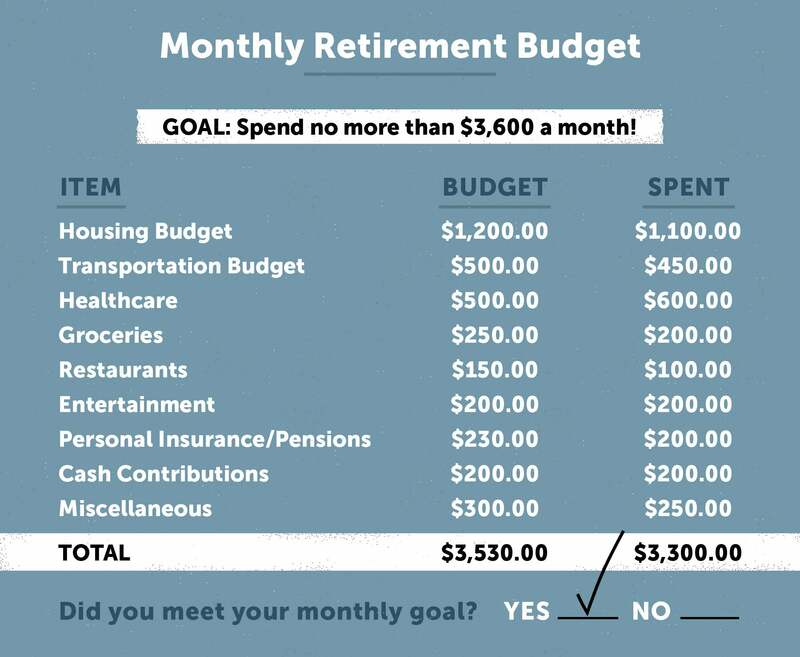 Here is an example of a simple monthly budget for a retiree aged 65 who plans to live in retirement for twenty years. With a monthly budget goal of spending no more than $3,600, he should expect to spend no more than $43,200 annually and no more than $864,000 over the course of his twenty year retirement. Retirement is not always as simple as you might think. Often, new retirees are shocked to find out that the cost of retirement may be more expensive than planned for. To budget exactly how much you’ll need for a comfortable retirement, you’ll need to understand your likely retirement expenses. It’s safe to estimate on the high end for all expenses. Along with what you think you’ll spend, you should plan to have additional money set aside in case your expectations are wrong. Don’t plan to spend much less than you do now. There are a few questions you should ask yourself before you begin budgeting for retirement. How much are you spending now and how will that change once you’re retired? How much retirement income do you expect to receive? What is your current state of health and the average life expectancy of your family? Determine what your monthly expenses will be by considering things like health care and insurance, travel, housing, auto loans and any other miscellaneous costs. Developing a spending plan can also help curb unnecessary costs and keep your spending habits in check while helping you save for unexpected situations. There are many easy ways you can cut down on your expenses without putting a dent into your comfort. Shop for new Medicare coverage. Previous coverage plans may not be the best deal for you anymore. Medicare policies are constantly changing so be sure to stay updated on the best plans for you and your spouse. Make one shopping trip a week. If you plan meals and supplies properly, you can drastically cut down on grocery bills by limiting yourself to one trip per week. In turn, this will help cut down on impulse purchases and gas spending. Buy generic instead of name brand. Generic brands at grocery stores are often considerably cheaper and similar quality. Prescription medication almost always has a generic alternative, as well. Bargain for lower interest rates. If you’ve been a member at a financial institution for many years, you may be able to get lower interest rates just by asking. Remind them that you’ve been a loyal customer and would appreciate a small reward for using their service. Additionally, you should consider the cost of living in your state. The average cost to retire comfortably varies greatly across the states, so it may be helpful to consider moving if you’re worried about funds. Here are the yearly costs to live comfortably in each state, ranked from least expensive to most. Consider an annuity. Annuities are bought by making a payment to another party, who in turn promises to make payments to you for a specified period of time. Annuities may be offered by insurance companies or financial institutions. Annuities are a relatively simple way to guarantee a source of income, but they do come with potential risks. Be sure to research an annuity being offered to you before signing a contract. Consult a financial planner. Financial advisors are trained to answer all your questions regarding finance and investment. They are available for short-term assistance or long-term financial management projects. Before consulting a financial planner, be sure to research their title, credentials and company to avoid giving out information to a potentially fraudulent source. Avoid investment risks. For senior citizens and retirees, it may be tempting to immediately increase income by reaching for dividend yield. However, reaching for greater dividend yield often leaves seniors vulnerable to loss and financial abuse. Additionally, there’s a significant interest-rate and credit risks to dividend investing. Always research and consider asking for advice before making a decision that could potentially cause significant losses on investment. With retirement often comes the need to change aspects of your financial management. Many banks offer special services for seniors and retirees. Your banking services should help you plan for future medical costs, everyday spending and everything else you need to live comfortably in retirement. Proper management of these services can help you maximize the benefits you receive from your bank and potentially increase your overall savings. Easy banking – setting up automatic payments and direct deposits for your social security checks, pensions or veterans benefits can make access to these funds easier and minimize your trips to the bank. Social security – social security is designed to offer cash benefits based on work history and the amount you paid into the service before retiring. This service helps you meet your needs due to loss of income as a result of retiring, disability or death. Retirement accounts – workers age 50 and older can choose to defer paying income tax on up to $24,000. They can instead contribute to a 401(k) plan. Additionally, retirees ages 70 ½ and older can avoid an income tax payment on an amount up to $100,000. They can instead transfer this directly from an IRA to a qualifying charity service. No penalties when withdrawing from IRA – Seniors age 59 ½ and up no longer pay a 10 percent penalty when they withdraw money from their IRA. Additionally, if you leave your job at age 55 or up, you can take withdrawals from your 401(k) without penalty. AARP membership – For a small yearly payment of $16, AARP offers a large variety of senior discounts and services. As a member, you may be eligible for up to 25 percent in savings. AARP also offers services for money management, free tax assistance, financial and estate planning, and education on Social Security and Medicare. Members may also be offered member-exclusive insurance programs and interest rates. Senior discounts – the next time you visit a restaurant, flaunt your age. Many restaurants, retail establishments and entertainment venues provide reduced or free prices for seniors. Senior services like AARP negotiate discounts and can get you even more benefits. Travel benefits – hotels, airlines and car rental services may also offer discounts for seniors and retirees. The United States National Park Service offers lifetime passes to over 2,000 federal recreation sites for just $10 in person. These perks are designed to help you live your retirement to the fullest. Health insurance – Seniors age 65 and older are eligible for Medicare. Alternatively, if you are a low-income senior or retiree, Medicaid has been proven to help assist in covering Medicare costs and fees. Education – many public colleges offer seniors the ability to take classes at free or reduced rates. Most schools also allow seniors to audit (sit in on lectures without course credit) for free or minimal cost. Consider signing up for an Osher Lifelong Learning Institute service, which is offered at over 100 college campuses and has classes designed for retirees. After years of helping family, some seniors are at risk of carrying heavy debt loads into retirement. Additionally, moving to a fixed income plan can make it even more challenging to balance debt payments and stay afloat. Some seniors may turn to credit to help fund an unexpected expense like a medical emergency. Before making a purchase with your credit card, consider whether you’ll be able to pay the balance in full when the statement arises. Remember: even small expenditures can add up to big credit card bills. Contact your lender. If you fall behind on your payments, contact your bank or lender to see if your loan is adjustable. Many credit lenders are willing to work with you to make sure you can pay your bills on time. Consider a credit counselor. Experts may be able to help you come up with a specific budget for your credit accounts and help you streamline your spending habits. Use a reverse mortgage as a last resort. If you take out a reverse mortgage – a loan that allows you to use the equity of your home and delay repayments – are required to pay property tax and homeowners’ insurance. If you fall behind on these payments, you may be at risk of foreclosure. Check your statements and reports regularly. Seniors occasionally experience confusion with their credit cards, interest rates and other banking products. This can lead to late fees and unpaid bills. Monitor your monthly statements and look for unusual charges and make sure your card is working properly. Small mistakes on your credit reports can make it more costly for you to buy insurance or borrow money. It’s important to consider the way your debt will impact your family after you are gone. Even if you leave your family with a large estate, your personal debts can diminish the estate’s value. Any debt you owe at the time of your death is paid off using the money in your estate. If there is remaining money in your estate, it will then be distributed to your beneficiaries. Debts paid off first by your estate include funeral expenses, taxes and secured debts. Next, your estate pays off unsecured debts like credit card bills. If your estate doesn’t have enough money to pay off all debts, the remaining amount owed is waived. Financial fraud and scams are the most dangerous threats to seniors in regards to their finances. Always be cautious when giving out personal information and take the steps necessary to prevent scam artists from hurting you and your family. Financial fraud affects people of all ages, but seniors are particularly at risk for identity theft and financial scams. Scam artists know that senior citizens are more likely to have accumulated wealth and other assets than younger adults, so they may target seniors exclusively. There are “red flags” to look for when entering into a financial agreement or hiring a new financial consultant. Watch out for these indicators with every financial decision you make. Research a new financial institution before giving over any personal information and be cautious when giving someone legal access to your finances. Protect your personal information like Social Security numbers, passwords and account numbers. Never give out your information to an unknown source and use unique passwords for every account. Also consider updating or changing passwords every few months. Sign up for direct deposits to minimize the number of “stops” your money has to make on its way to your account. This reduces the likelihood of a scam artist gaining access to your funds. Consider setting up a trusted family member with access to your statements so they too can monitor for suspicious activity. Your estate is your gift to your family after you pass. Though discussing your death and time after you’re gone is difficult, planning for your passing can help your family better navigate the emotional stress of loss and will ensure you continue to provide for and protect your family, even in death. End-of-life planning is a topic most people prefer to avoid. It can seem grim and even scary for some. But to protect your assets and your family, it’s crucial to have a formal document pre-written for your death. Preparing a will helps take care of your loved ones financially after your death and can save them the emotional stress of legal difficulties after you’re gone. If you do not yet have an existing will, you’re not alone. A 2017 study showed that only 42 percent of American adults have a planning document such as a will or living trust. Luckily, there are many services that can help you write a will. Attorneys and even online software are excellent resources to help you create the document. Enlisting the help of experts is the best way to be sure your will adheres to all the legal requirements necessary for such a document and makes it easy for your loved ones to collect their assets after your death. It is legal, though much riskier, to write your own will. There are resources available to provide instruction on drafting a will from scratch. Be sure to follow the necessary guidelines and requirements in order to create a legally acceptable will. If you are unsure which option to choose when you’re ready to create your will, consider the consequences of both choices. If you know your assets and portfolio at the time of your death will categorize you as middle class, using an estate software or simple legal service may suffice. However, if your assets and portfolio are considerably large, an official estate attorney may be necessary to properly protect your assets. Choose your beneficiaries. These are the people you select to receive your money and belongings. If you use a software to create your will, there will be a section to identify the beneficiaries you’d like to include. If you use an attorney, he or she will write them in for you. Choose your executor. The executor is the person tasked with carrying out your wishes after you pass. This person should be extremely responsible and willing to take on the task of closing your estate. If you hire an attorney, it’s possible to choose them as the executor of the will, though you should expect to spend up to 4 percent of your assets on their fee. If you prefer a family member or friend to execute your will, consider additional compensation for their efforts. Also consider appointing an alternative executor in the event that your first choice is unwilling or unable to perform the duty upon your death. Be specific about your assets. Even if you’re very close with your family, it’s unwise to assume they’ll know what to do in the event of your death. Your will should be highly detailed to help loved ones avoid any miscommunication. If you have multiple children or stepchildren, you should specify exactly what assets you wish upon each of them. If your spouse survives you, it may not be wise to leave them the entirety of your estate, especially if you have children. If you leave your whole estate to a spouse or partner, they are not legally required to distribute those assets to your children unless you specify that they do so in your will. Get witness signatures. You’ll be required to have individuals who don’t stand to inherit anything from you sign your will as witnesses. These witnesses should be at least 18 years-old and are used in the event that one of your assets is contested in court. In most states, you’ll need at least two individuals to act as witnesses to your estate. The loss of a spouse or partner is consistently listed as one of the most painful life events a person can experience. The period of time following a loss of this magnitude comes with a wave of intense emotion and difficulty. Financial challenges after the loss of a spouse can make life even more difficult for the surviving partner, especially if that partner was not used to managing the money. Ideally, both partners in a relationship have basic knowledge of financial management. If this is not the case, however, make time to communicate with your spouse about what should happen in the event of a death. Write an instructional letter. These letters can contain instructions on where to find important documentation and estate planning information in the event of a partner’s passing. Be clear about your wishes. Communicate with both your partner and your family if you have specific wishes for a funeral or memorial, burial, cremation or other end-of-life event. If you have no specific wishes, be sure to let them know that, too. Prepare for medical decisions. If you become ill and are hospitalized, communicate to your partner your wishes. Resuscitation, life support and treatment are all medical procedures you have control over. If you are unable to communicate after falling ill, your family should know your preferences and act accordingly. These are not easy topics to discuss with a loved one. But they will save your spouse additional pain if they survive you and must carry on alone. Helping each other prepare for end-of-life matters is a necessary step and shows your dedication to each other’s wellbeing. Create a family trust fund. Pass funds on to future generations in a responsible way by setting up a family trust fund. These accounts can be drawn on by anyone with access to them and are a good way to provide additional savings to family members after you pass. Set up a 529 plan. Another way to significantly affect a loved one’s financial strength is through a 529 plan. A tax-advantaged 529 Account is an educational savings plan that offers tax and financial aid benefits. 529 plans can function as prepaid tuition accounts or as college savings plans. These plans are ideal for retirees and seniors as they provide several special tax benefits, including 5-year gift tax averaging and tax-free qualified distributions, full control of the account. Though contributions to the plan are not deductible, they offer unsurpassed income tax breaks and require minimal maintenance. Setting up a 529 plan for a child, grandchild or other young loved one is a practical way to continue caring for them as they grow. Additionally, you’ll be helping to guarantee their access to quality education. However, you should always be cautious in your contributions to others. If a loved one is struggling financially, it is tempting to open your wallet to them. But avoid overfunding a loved one as it can put serious strain on your own finances. It’s important to protect your money, even when helping your family. Your goal should be to maximize the funds you’re able to gift them at the end of your life. Until then, you’ll need the money, too. Give the gift of education to your family by teaching them the importance of financial knowledge and planning. Creating a future generation of intelligent savers, investors and consumers will help to improve economic health and lead to fuller lives for your future family. As a mentor and role model in the lives of your younger family members, you can have a profound impact on the financial education of the next generation. Self-control, basic mathematics and consciousness are all teachable skills that you can impart on your children and grandchildren. Other financial lessons you can give to children include restraint and patience during a purchase process, choices about how to spend money, how quickly to begin saving and the basics of credit. A 2017 study suggested that children who are allowed to manage their own money from a young age are more likely to have better financial habits. You can help your young family members begin understanding the concept of saving by giving letting them practice money management. Give them a small allowance each month until they have enough to pay for something on their own, perhaps a bicycle or toy they’ve been eyeing. Letting them decide whether to spend or save allowances will give them hands-on experience with money and help them understand that money is a privilege and not a guarantee. Imparting your own wisdom and personal experience on your children and grandchildren is one of the greatest gifts you can give them. Your influence and guidance can help raise a new generation of consumers who are even more intelligent and mindful with their money. If you’re struggling with credit, debt or financial decision-making, there are many resources available to help you make the right choices. Ask a family member for help or consider using a professional service to put you on the right track to financial success in your retirement. Planning for retirement can be a difficult task. There are many decisions to make and limitless options to choose from. But preparing for your retirement and senior years will significantly impact your ability to live the lifestyle you want. Whether you plan to travel the world or enjoy treasured time with family, we hope this guide has given you useful information and will help you put financial plans into place, execute them and achieve your financial goals.